Most see letter grades as a more objective way of grading. They are calculated using a mathematical equation, therefore they are more cut and dry. Letter grades are easier for parents to understand and monitor. They can look at a quiz that may have a score of 8/10 and they know that is an 80%. Teachers can better justify a grade through their grade book. It goes back to the basic mathematical equation; you can weigh assignments differently, but still use the same system. Those that are against letter grades usually point to the stigma that comes with this type of system. You have your “A+” kids and those that do not earn passing grades. We are more protective of children and their self esteem now more than ever. Anything that may harm a child’s confidence is seen as a negative. Rubrics give a specific breakdown of the skills assessed on a given test or assignment. The pressure often associated with letter grades is not as much of an issue. You can see a progression through a particular skill set when you compare two rubrics. Opponents of rubrics tend to feel they are more subjective than a letter grade. Also, as parents who grew up with letter grades, the rubrics can be difficult to understand. Our school spends a great deal of time acclimating parents and students who are new to the district in an attempt to educate them on the use of the rubrics. In the above learner’s profile (fancy term for grade card! ), you’ll see that the two subjects listed are broken down into skill sets. So instead of getting a letter grade for the first quarter in reading, the teacher writes a number for each skill in order to rate the student’s progress. Parents can see where the student is growing throughout the year. 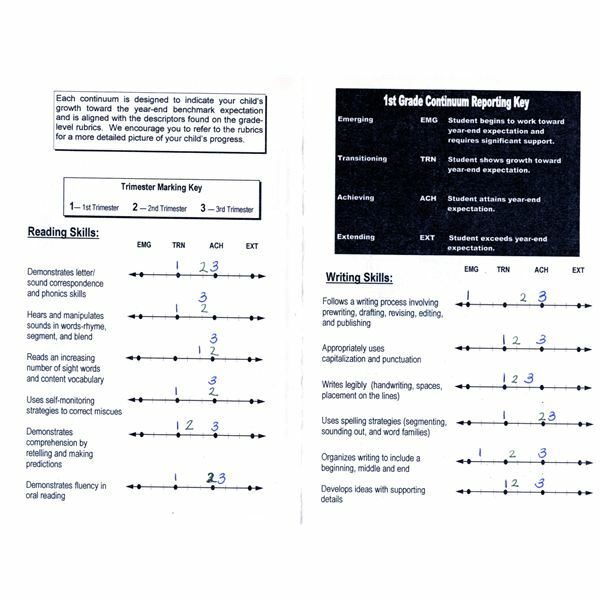 This system gives parents more information about the particulars of a subject and may help focus on particular weaknesses a student may have. The black box gives explanations of each marking, helping to reinforce the meanings of each. With this particular system, the goal is to reach Achieving (ACH) by the end of the year in each listed benchmark. 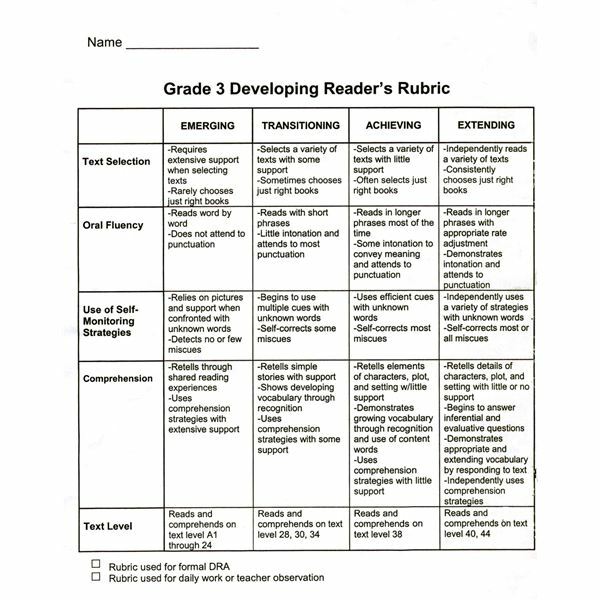 In the above reader’s rubric, a teacher can give parents specific information on a student’s reading progress. Again, instead of the child bringing home a “B” on an assignment, the teacher will circle where the student falls for each specific skill. When a student brings home this rubric throughout the year, parents can see where the student is progressing and where they need work. Students are expected to reach Achieving by the end of the school year in each listed benchmark. Which System is Most Beneficial? This is a loaded question. What works for one district or teacher may not work for others. As we can see, there may be a place for both. In my particular situation with my children, I would like to see an overall letter grade with a small breakdown of specific benchmarks that can fall on a rubric. The letter grade gives you a better overall picture of performance, but the rubrics can show a picture of where a student’s strengths and weaknesses are. Either grading system can work depending on your situation.